Applies to Nvidia only, don't know about AMD cards. I'm still learning the ropes of playing Tiger. It's not that strong at all and needs plenty of intel to be useful. Once that gun goes off though, so does it's target. Getting swamped by too many tanks is the problem I have. Most fun I've yet had was in Pz III M, going around in SB and popping stuff up from side & behind. Really fun tank over all. Only thing to complain about WT tanking so far; the bigger the tanks are, less fun it gets. As I'm storming the flag, I see teammates sitting in their better tanks almost at respawn, sending shells a kilometer away hoping to hit something vital. Yay. I always go for close up and personal, but that can mean I end up against 3-4 heavies and that's it then. Off-Topic / Re: Which kind of music are you listening to? It's not the kind of music I'd say I listen, but... it stuck with me. Community Polls / Re: POLL : Which OS do you use for FH2 ? Windows 8 makes better use of the CPU than 7 in general. I'd suggest Win8.1 for everyone, as it is less bloated with services & software. In that way, it does make better use of CPU & memory, or rather doesn't hog it all for itself. Gamers can benefit nicely of it. But there are things that are messed up or conciously forgotten, like ability to customize your Windows. You have to delve into registry these days to modify how Explorer looks like and even that is not 100% working. If you don't mind the fluffy look and limit your desire to modify it to desktop background and window border colors, take it. Think of it as a streamlined version of Win7. People worrying about that big bad start menu, don't. I almost never use it since all the software I need is in Taskbar or else. And you can sort it out, have all that Win8 Modern interface crap cleaned out. Few tutorial videos and you're right at home again. What I like most about it is working sleep mode. Win7 sleep always broke up after a while and needed a fresh install to start working again. They fixed something about that in Win8. They took a right step with the background stuff and I think Win10 is going to be a good one. Only con is you cannot use the free mouse view (ctrl+mouse). You could try JoyToKey for that and have it go left or right by press of a button. I had that on my joystick's hat for flying. You can also set how fast it moves, etc. And no need to change that Ctrl+Mouse setting in BF2 either. Got back to WT since... 2013 or so. Before tanks came along anyway. Damn I had fun last night, 6 hours straight popping tanks! Loving it so far! Couldn't find their help website so I decided to post it here, please help. 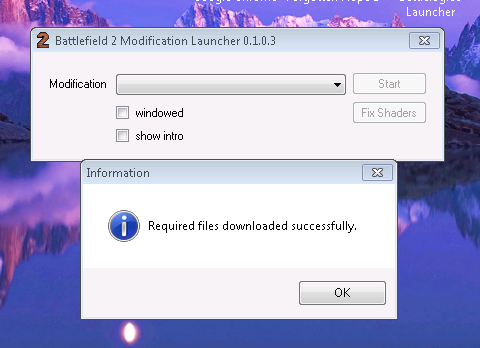 Something's amiss, it should show at least Battlefield 2 on that launcher's drop down menu. I first just downloaded the launcher, not any parts of the mod and played normal BF2 wondering why I can't see any servers... Then downloaded the packages and it added 'Alpha Project' after 'Battlefield 2' on that drop down menu. Maybe something wrong with BF2 installation? About the mod, a quick test on the server I could not see much difference to vanilla (this may be because I haven't played it for years!) Nice looking levels etc, but pretty messy textures compared to FH2. I'll give it another go this weekend, maybe there's more people online then. I tried searching for this, because I felt like it'd been discussed or mentioned somewhere before. I guess it's a done deal then. A silly little thing came to mind when things were going to hell in a handbasket last night on Cassino. I slept on it, but still felt like posting about it. Could it be possible to display what other SL's are ordering on the map? Like a gray line from SLs of another squads to their given objectives? This could be visible to other SL's only or even all players. Maybe it could help people focus their play and go like "ahh, no one is attacking/defending that flag, we go there!" I think the idea's roots are from another thread about mapping and 'funneling' players like water etc. and the fact that like 1% use that mic. EDIT: so like that! Anyways, on the pic squads 1,2 and 3 are attacking, SL of squad 4 has died on his heroic decoy mission and only his troops are alive on top, but the marker is still visible. FH2 Help / Support / Re: Launcher will not Launce game! Remember to make a copy of that file before you change it. I'm bringing some friends along soon, we'll see if they quit after a week or two. They are new to FH2 at least. I can't remember if one of them tried FH1 back in the day. I don't know if you guys are talking about daily quit rates or totally quitting FH2. Sometimes 2-3 rounds are enough, sometimes it's fun for hours. It helps if the teams are even a bit balanced at least in some maps. It's really taxing to go against frigging A-team round after round with a bunch of players that just can't get it done. I can sometimes compensate by going SL, but that pays off rarely, and often ends up with "f*** this" + Alt-F4. Then again, I often switch to the underdog team, so... guess I deserve it. Quitting totally is something that shouldn't matter. This is not for everyone. Just like I get pissed off playing BF3/BF4, others get pissed off playing FH2. I don't see how changing 1s1k to 2s1k would help here. The new guys would still get mowed down the same. This game is a rare gem in todays FPS genre. It should stay that way. More content, some bug fixes, little tweaks where needed and it's all good to me. Video recorded last night on 762 and is unedited. Quality came down horribly when I did the quick audio gain... 4GB mp4 reduced to 900MB mp4, so quarter of it's original quality. This is something that's probably impossible due to engine limitations, but I've been thinking something like this for a while. Posting it here, since it's not a big issue. No idea if it's come up before. A message, at the end of a round, telling everyone if the round ended in Allied Decisive Victory, Axis Minor Defeat, Allied Major Defeat etc. Just like in Panzer General. Depending on what side you are on, maybe? Could be based on percentage of tickets left each side, taking/losing all flags or something? I don't see any other use than the e-peen for now, but maybe later it could be used with objective maps or something? Like British Commandos being unable to destroy a dam or something and although they are winning by score when time is up, they still lose for failing that objective.